​1) There is a non-refundable annual registration fee of $25.00 per student. 2) Tuition is due on the 1st day and payable by the 10th day of each month, September through May. 3) A $10 late fee will be assessed after the 10th. 4) Only past due accounts will be billed. 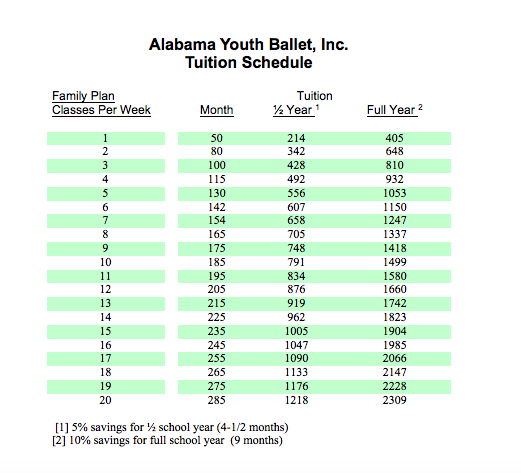 5) Checks are made out to either Alabama Youth Ballet or AYB and may be dropped in the lock box near the office window. Please note student’s name on check. 6) Full & 1/2 year tuition must be paid by September 15th and January 20th (for ½ year) or the account will revert to monthly payment. 7) Tuition may not be prorated for missed classes. Instead students may make up classes any time during the term in which they are missed. 8) Refunds are available only in case of prolonged illness or if a family moves out of the area. 9) Refunds cannot be made for involvement with sports teams, school plays, personal vacations, family visits, expected childhood illnesses, or loss of interest. 10) There is a $35 fee for any checks returned or resubmitted for insufficient funds.